The PT-DW10000U is Panasonic's new Full HD DLP system projector with 10,000 lumens of brightness. The PT-DW10000U is a full high-definition projector that can faithfully display HD content. High brightness is assured by a four lamp system that delivers 10,000 lumens, while dynamic iris technology achieves an outstanding 5,000:1 contrast ratio. Three-chip DLP technology provides excellent resistance to deterioration due to aging, making the PT-DW10000U an extremely reliable system projector. Panasonic recently announced a 10,000 lumen three-chip DLP projector with specifications aimed very much at the high end market. The PT-DW10000U which ups the native resolution to 1920 x 1200 pixels. The PT-DW10000U features 5,000:1 contrast ratios, 10-bit video processing, a liquid-cooling system that allows the projector to operate in ambient temperatures of up to 45°C (113°F), individual screen sizes above 10 foot x 10 foot, 30 percent smaller casing than the models that they replace, and an Auto Cleaning Robot which keeps the filter clean for up to 2,000 hours without external maintenance. That "Robot" could simply be an automated wiper that moves dust away for all we know, but unfortunately we'll never get to check, because the PT-D10000U comes in with a MSRP of (PT-DW10000U) at $74,999. Now available to rent for your next event. Rent for Live Events, Media Environments, Stage Sets, Exhibits or Themed Environments, Meetings, Corporate Theater, Promotions, Parties, Awards & Entertainment Events, Public Relations & Industry Press Events, Road Shows, Traveling or Permanent Shows, Museums, Film & Television, Sponsorship Presentation, Special Environments for all occasions. Projectors come in a wide range of light output. All other things being equal, the brighter the projector, the more it costs. When it comes to "optimum brightness" the rule is simple: Get the brightest projector you can afford. Brightness is measured in ANSI (American National Standards Institute) lumens: the brighter the projector, the higher the ANSI lumen rating. 1000 to 2000 lumens – this lumen range is a step up in performance and price. There are many SVGA and XGA products in this class to choose from. These machines are suitable for normal business conference room, classroom use and for home theater use. Presentations should be done with the room lighting reduced somewhat for best screen viewing, although dimly lit room is usually best. 2000 to 3000 lumens – this represents the high-performance range of the portable and semi-portable projectors. Products in this class are suitable for large conference rooms, Large classrooms and Really lit Home theater. They offer more flexibility in terms of ambient room light, since the image is bright enough that a reasonable amount of room light can be tolerated without washing out the image. They also offer more flexibility in terms of audience size since they can illuminate a larger screen without much loss of image quality. 3000 lumens and up – the ultra-bright projectors are in several performance classes unto themselves, ranging from 3000 up to 12000 lumens or more. Prices of these products also cover a wide range depending on other performance characteristics. They are used in a variety of large venue applications, including board rooms, conference rooms, training rooms, auditoriums, churches, concerts, nightclubs, and so forth. 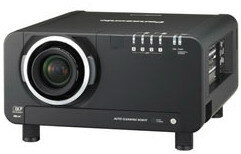 Sanyo PLC-XP45 LCD projector is loaded with features including full HDTV compatibility, power zoom and focus, digital keystone correction, 16x digital zoom, dual computer and video inputs, auto switching universal power, progressive scan system for high quality video, and an unbelievable 3500 ANSI lumens of power! Now with a amazing 800:1 contrast! The Sanyo PLC XP56 projector is designed to be installed in large venues such as auditoriums, lecture theatres and large conference rooms. The Sanyo PLC XP56 projector at 9.2kg is a heavy projector and is ideally ceiling mounted in one location. If you are planning to keep moving the projector between locations, then consider a lighter projector instead. 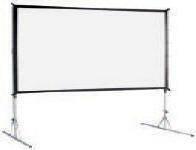 The brightness of a projector determines how large an image can be displayed on screen and therefore the audience size. Projector brightness is measured in ANSI lumens. The higher the number of ANSI lumens, the brighter the projector is. All our projectors are designed for indoor use and cannot be used in direct sunlight. The Sanyo PLC XP56 has 5000 ANSI lumens which is extremely bright so that images can be projected onto screens which can easily be seen by many hundreds of people. This projector is for use with computers that display a 1024x768 pixel image. You can check the resolution of your computer on a Windows computer by opening the Control Panel and double-clicking on the Display icon. Then click on the Settings tab. The 1024x768 (XGA) resolution is currently the most commonly used. The Sanyo PLC XP56 projector can be used with video recorders, DVD players, video cameras, satellite systems, TV games consoles and other video sources. This projector has built-in sound but this gives limited volume. If high quality or high volume sound is required then consider connecting to an amplifier or surround sound system (home cinema or professional). Computer sound can be played through the existing computer speakers which is normally adequate for computer presentations in small rooms. The PLC-XF40 from Sanyo - one of the world's largest and most successful manufacturers of LCD projectors - is a truly professional, high-end device for fixed installations. A brightness of 7700 ANSI lumens and 700 : 1 contrast ratio guarantee powerful presentations. The PLC-XF40 is ideally suited for fixed installations in very large presentation rooms and movie theaters. Thanks to its powerful brightness, this projector is also suited for open-air broadcasts of sporting events and large events in broad daylight as well as for the projection of large-scale advertisements at airports or train stations. The resolution of 1024 x 768 pixels (XGA) can even be increased to SXGA or UXGA resolution levels using DRIT (Digital Realized Interpolation Technology). A new 4-lamp system with four 200W lamps ensures fail-safe operation, if one of the 4 lamps fails, the projector switches to 2-lamp operation automatically. The available range of optional lenses is the same as with previous models; all of these lenses can be used without difficulty with the PLC-XF40 as well. With the power shift function, users can vary the position of the lens to the screen by up to 100% vertically. Various high-end connectors are available for use in a professional environment. The component interface for high-quality video transmission - using separate red, green and blue transmission - produces very sharp images with extremely accurate color quality. The DVI interface provides a direct connection between the digital image source and the projector. Loss of signal quality during transmission is now a thing of the past. The new progressive scan system also ensures an excellent video image. DVD and HDTV compatibility is also included with the PLC-XF40 of course. Additional functions like Freeze, Digital Zoom and No Show round off the extensive list of features of this projector. Sanyo offers advanced tools for network control and administration of select Large-Fixed, Fixed, and Portable series projectors. Through a CAT5 LAN connection using the IP addressing scheme, projector functions such as power status, lamp status, input mode, signal condition,lamp-use time, etc. can be monitored using a web browser.No additional application software is needed. an E-mail Alert message can be sent to the registered E-Mail addresses. An Automatic Timer function can turn on or off a series of projectors at a specified day, date and time. With Multi-Control, a single computer can control and setup multiple projectors at the same time. RS-232 control systems may be used in parallel with these Sanyo network control components. Select models utilize a newly developed 6500°K color temperature optical system for more realistic color reproduction. This color-focused design makes these projectors highly suitable for digital cinema applications. Select Sanyo projectors offer Color Management solutions allowing for changes to both color phase and color level to obtain perfect color reproductions. With the Real Color Manager system, white balance adjustments and gamma correction are made from a PC using the included image adjustment software by simply comparing the on-screen image to a printed color chart. With the Color Management System on select portable units, only the small area surrounding the selected color is changed without affecting other colors or adjustment items such as Tint or White Balance. presented on the wireless-networked projector, from a PC connected to the network, Images being shown by the projector can be viewed simultaneously on the networked PC. Additionally, built-in control software allows for wireless control of projector functions by a PC using a web browser. Sanyo's optional presentation viewer module allows images stored on a Compact Flash memory card to be shown directly from the projector. Media Card Imager ( MCI) software, also included, enables the user to quickly and easily convert any PowerPoint presentation into a series of JPEG files and save them to the memory card. A wide array of connectivity options is available with Sanyo projectors featuring the Multi-Versatile Platform (MVP). Detachable interface panels including inputs for HD-SDI, SD-SDI, Faroudja™ video processing, DVI, 5-BNC, D-Sub15, Video Y/C and S-Video can be used in varying combinations to meet the source input needs for most any situation. Sanyo's Faroudja™ Interface Board, for use with projectors featuring the Multiversatile Platform (MVP), processes all incoming video signals using 3 Faroudja™ video processing IC's as well as Sanyo's new IC for 3D Y/C separation. Jitter-free video performance, improved depth perception, automatic 3:2 pulldown, the elimination of objectionable staircase artifacts, and near-HD quality images are the result. A newly developed progressive integrated circuit provides highly improved playback of moving images. 1080 interlaced signals are converted into progressive signals while 2-3 pulldown doubles the resolution of images from DVD playback. Sanyo's Efficient Lamp Management System monitors and controls each individual lamp on our multiple-lamp projectors. Each lamp's status and cumulative hours of use can be displayed on-screen and, if a lamp expires, the fail-safe feature automatically switches to the remaining good lamps to keep the projector running. When selected, the half-brightness mode shuts down half of the projector's lamps to maximize lamp life when full brightness is not required. 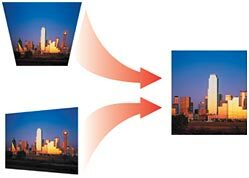 Sanyo's Digital Keystone Correction feature compensates for angled projector placement by digitally and mathematically interpolating an image's pixels, correcting keystoned (trapezoidal) images. Most Sanyo projectors offer digital keystone correction, while some models now offer Sanyo's new X-Y Digital Keystone Correction, which corrects keystoning both vertically and horizontally. Select SANYO LCD projectors offer power lens shift to aid in greater placement flexibility. Many units now offer X-Y lens shift, which moves the lens both vertically and horizontally. Power lens shift also aids in the twin-stacking of two projectors, easily aligning the images from both projectors with virtually no geometric distortion. Selected SANYO projectors are High Definition Television (HDTV) compatible, accepting the 1080i, 1035i, 720p, 575p, 575i, 480p and 480i HDTV resolution standards. A wide range of optional lenses is available for many SANYO LCD projector models in our Large Fixed, Fixed and Portable model classes. SANYO's line of optional lenses offer outstanding clarity along with increased placement flexibility. Sanyo's new One-Touch lens system makes installation and removal our optional lenses a snap. Select Large-Fixed and Fixed models utilize our new One-Touch interchangiable lenses mount adapters that attach to the lenses, allowing for quick and easy lens swapping. Select Portable projectors are equipped with a new bayonet -style lens mount system that eliminates wired connections for the zoom and focus motors. Select Sanyo projectors come equipped with our new Eco Mode system that effectively lowers the projector voltage, reducing power consumption and fan noise, when optimal brightness is not required.